So I’m sure lots of you have seen this challenge making the rounds on the internet and well I got nominate to do the challenge and got a bucket of ice water thrown over me. Along with this I also donated to the Irish Motor Neuron Disease association which is the most important part of the challenge. Many people may think that theses challenges such as the ‘no make-up selfie’ that made the rounds a few months ago for cancer are silly but I disagree. These challenges are helping to raise awareness and the profile of many illnesses out there and they are also helping to raise much needed funds for the associations that help people who live with these illnesses and also to help with research into helpful medicines and cures . I for one have to say that I didn’t know much about Motor Neuron Disease before these challenges came about but as they kept coming I decided to look into it and I have to say that I am now more aware of this illness and the way that it affects so many people across the world. These challenges just so the power that social media can have in a positive way that can help so many people all over the world. Also it shows the way in which a world of over 7 billion people can work together to help those of us who are suffering. To me it shows a great spirit and togetherness when people all over the world who don’t know each other are all doing these challenges and helping people they may never know have a better life by raising awareness and donating much needed funds for these charities. 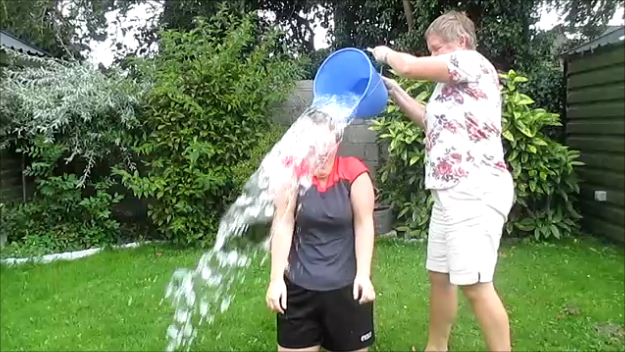 So I got soaked with a bucket of ice-cold water but my donation of €20 could help someone out there in their daily life living with Motor Neuron Disease and I think that that is the most important thing to take from these challenges, the impact that they can have on strangers that you may never meet but are helping immensely.